MSI partners with ASMedia to develop the next generation USB controller which yielded to the creation of the ASM3142 USB 3.1 Controller. The ASM3142 claims to offer the fastest USB 3.1 speeds and performance today setting up the newest standard in super-fast USB data transfer. The Lightning ASMedia ASM2142 USB 3.1 Gen2 controller that runs at PCIe Gen2 16Gb/s already offers superb data transfer speeds, the next generation Lightning ASMedia ASM3142 USB 3.1 Gen2 offers an even better performance along with 50% power savings. The ASM3142 consumes less power while maintaining performance thus achieving higher energy efficiency. ASMedia Technology Inc. vows to continue its development on the latest technologies for the next generation PC hardware to come as they also work closely with MSI. With such unique partnership, MSI and ASMedia aims to set new standards for ultra-fast data transfer speeds using the USB interface. Also, expect the latest ASMedia technologies featured in MSI motherboards. MSI is wasting no time to feature the new ASMedia 3142 USB 3.1 Controller on its motherboards. MSI is preparing to feature the ASMedia 3142 on to upcoming MSI Z270 GODLIKE GAMING motherboard as well as in other upcoming high-end desktop motherboards. The MSI X-Boost software further improves the USB performance of the motherboard. 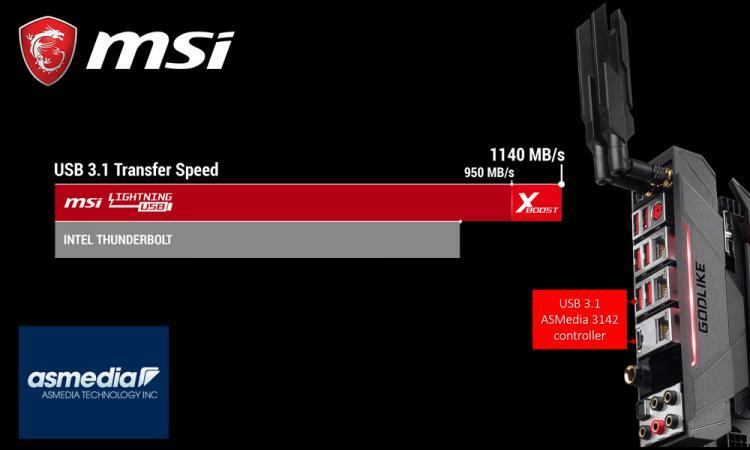 Aside from the native performance specifications of the new ASMedia 3142 USB 3.1 controller, the MSI’s X-Boost software is available to boost USB performance up to 5% for any device. X-Boost auto detects fast USB devices and enables performance enhancements immediately.